EXECRATION full European tour announced for January 2018! 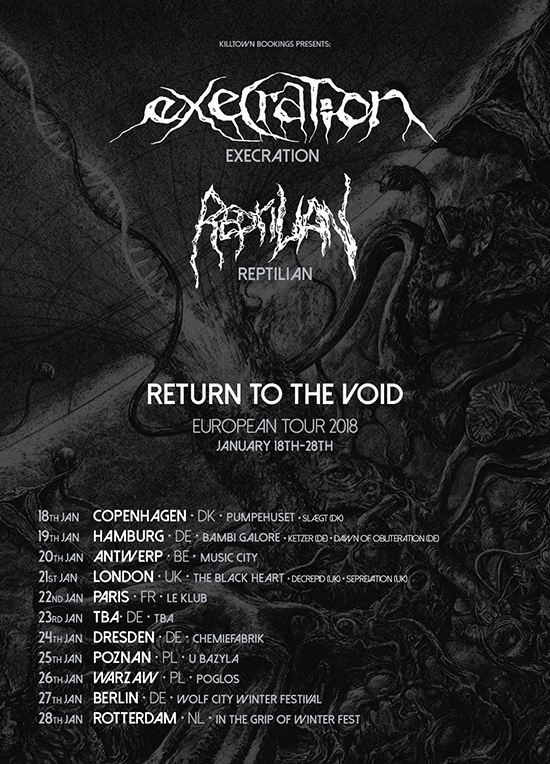 Norwegian Death Metallers EXECRATION released their latest album ‘Return To The Void‘ last July via Metal Blade Records. Today the band announces a full European tour in support of this longplayer. Check out the dates below! Surf over to metalblade.com/execration to watch the video for ‘Return To The Void‘ and check out more music from EXECRATION. At the same location you can order the album on Digi-CD and on vinyl! Thematically, the album takes off into outer space, the world of dreams, and philosophic musings on time and space. The album’s seven songs and two instrumental tracks are permeated with the mysteries of the universe, both in lyrical content and concept, and in the music itself. This theme is further brought to life by the magnificent art of Zbigniew M. Bielak that adorns the front cover.